Just what we need. Something to make Back Bay more expensive than it already is. Developer Ronald Druker submitted a proposal today for a new nine story luxury office building. 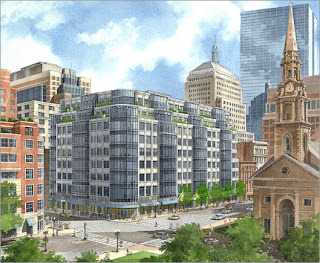 The new office complex is to replace the current Shreve, Crump & Low building on the corner of Boylston and Arlington. According to the proposal, it will be designed by famous architect Cesar Pelli and will be home to: underground parking, a fitness club, a restaurant, retail space, and offices. Expected occupants of the offices? International bankers, hedge-fund managers, venture capitalists, law firms. In other words: $$$$$. Druker only does high end, so expect rents to be sky-high. Among Druker's portfolio are: Heritage on the Garden, Atelier|505, and the Colonnade Hotel & Residences. See below for an artists rendering of what it could look like. Or click (here) to read the article in today's Globe. 0 Response to "Back Bay Luxury Office Building"